School girl quick art Thursday doodles and Zazzle discount! I felt motivated by one of my very talented online friend, missmonster, to make a Zazzle page for myself when I saw that she had designed a really neat looking pair of shoes thru Zazzle. 26 Responses to Be Zazzled! Is Zazzle kinda like cafepress? Is it better?! radiantdreamer I think zazzle’s user interface needs some getting used to, I did some googling for reviews and found that Zazzle apparently have one of the better printing for darker teeshirts :) I’m definitely gonna get some teeshirts from Zazzle for myself in near future! This is really cute chun. I like the art you have on the magnets. That or some like it would look nice on shirt as well. I will buy a shirt for my wife -if she hasn’t- and hopefully it will push business your way. I only just realized you’re talking about the green haired girl here lol! @FatB- LOL. Your comments never fail to make me laugh. FatB you gonna tear his ladies tee off his muscular body? 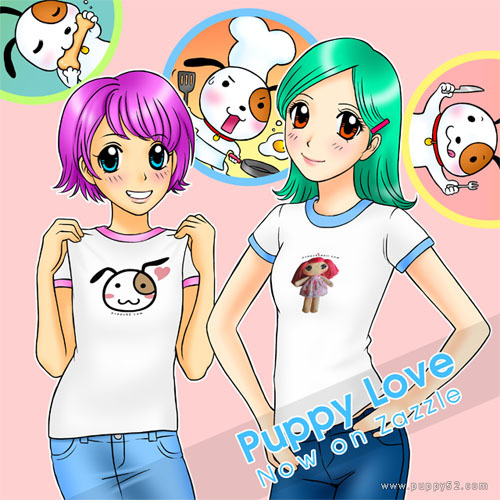 I like the puppy mascot one.. very cute. you have to design one for the guys :p I will buy one.